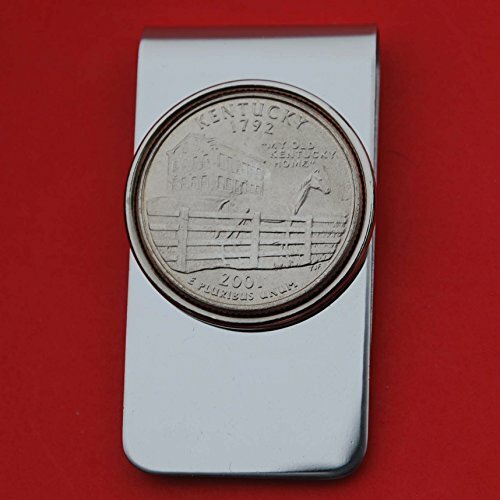 You are looking at a gorgeous money clip, set with an authentic United States 2001 Kentucky State Quarter BU Uncirculated Coin. The clip is about 2" x 1", made of stainless steel, and has never been worn or used before. I only use these coins with readable dates, never try to clean them, and always keep their collectible and numismatic values. I hope you end up with one of these beautiful coin money clip. This money clip will be great for holiday gift, investment purpose or just adding to your coin/jewelry collection. I will be happy to combine shipping for multiple items. Thanks!!! View More In Pendants & Coins.